What would be better than a movie based on the Metal Gear Solid games? A television series based on the Metal Gear Solid games! After what seemed like forever, it looks a Metal Gear Solid movie seems to finally underway. The planned movie has been in development hell for more than a decade now but it seems like Sony Pictures is ready to start production as they’ve already signed a screenwriter and a director. Of course, this is still all very early but, according to Jordan Vogt-Roberts, the man slated to direct the Sony Picture project, he wants to ensure that the film stays true to the tone of the games. An admirable thought, however, it does raise the question: can you make a Metal Gear Solid movie and cram in all of the stuff that makes them such fantastic and iconic games? Well, there is a possibility it could happen. But I think the possibilities would be slim. While I can applaud Sony Pictures for thinking big and making the adventures of Solid Snake into a feature length film, it’s something I can really visualize myself. No, I think the Metal Gear Solid experience would work much better as a television show, actually. It just doesn’t seem feasible to translate even the most important content of an entire Metal Gear Solid game and make it work in the confining space of a two or three hour film. There’s just too much stuff that’s in each game and each and every bit seemingly give each entry of the Metal Gear franchise the essence of what makes them so great in the first place. When we talk about Metal Gear Solid, we have to talk about the characters first. Despite each game being all about the bad guys trying to get their hands on a bipedal tank that can launch a nuclear weapon from anywhere on the globe, Hideo Kojima still made some of the most memorable characters in gaming. And each and every Metal Gear Solid game is littered with numerous memorable characters. From the rather straightforward protagonist in Solid Snake to his really complex antihero of a “father” Big Boss, there are just so many great characters to come out from the series. Each of these characters have some kind of backstory that’s fleshed out enough to show their motivations on why they do what they do. And that’s not even including the sometimes incredibly mind-numbing twists embedded in their backstories. That’s another thing that would be hard to translate to a two to three hour film; the rather complex and sometimes incredibly convoluted plotlines. In a Metal Gear Solid game, you, as the player, are given the time to go about the story as fast and as slow as you want. Sometimes, you really want some time to just take a breather to digest all the information that was thrown at you from the numerous CODEC transmissions and cut scenes the games have. Some of it moves the plot along or convey some specific information about the story or the game. Sometimes the dialog can just be all about the underlying message Kojima wants to mention, like “nuclear war is bad” and stuff like that. All of those cut scenes and CODEC conversation can be rather long as well. Much longer than a two or three hour movie, at least. Maybe you can trim some of the longer ones and cut out some of the more superfluous ones. But a whole lot of it is a strong part of a Metal Gear Solid experience. You can’t leave out any of the meat that gives Metal Gear Solid its distinct flavor. Trying to constrain and distill games as long as Metal Gear Solid into a single film seems to be a big mistake. Sure, a lot of games can seem like they’re trying to be movies at times but let’s be realistic. Most games can benefit from the more lackadaisical pace, free from the constraints of having to insert an action setpiece every fifteen minutes or so just to punch up the adrenaline levels of the audience. And games that have some semblance of a story nowadays generally take much more than the timespan of a film to wrap up everything. This is especially true for a game like Metal Gear Solid, which makes it much more suited for TV. Metal Gear Solid would benefit greatly from being a television show rather than a movie because they can be longer and, as such, can devote a whole lot more time to develop the characters and the story. They can make the characters as deep as they want and expound on their histories without having to compromise anything. They can get as profound with the exposition on the meaning of nuclear war, concentrate on making some really meaningful dialog without having to worry about editing some of the more heavy aspects of the story due to limited time. In fact, Hideo Kojima did a rather brilliant job in showing how a Metal Gear Solid television program would work already. 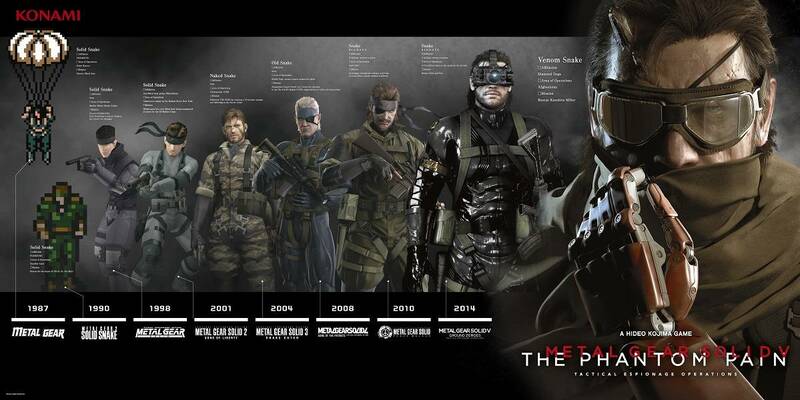 If you played Metal Gear Solid 4: Guns of the Patriots, Peace Walker or Metal Gear Solid V: The Phantom Pain, you can see that Kojima already plotted those games using an episodic format. It does show that the epic scale of the Metal Gear Solid games would be incredibly difficult to tell in a short span of time like in a movie. I can’t really say anything that I would satisfactorily cut from any of the Metal Gear Solid games, especially the later ones. In fact, with the way Konami butchered The Phantom Pain by cutting out an entire episode, Episode 51 to be exact, you can see how important each and every detail Kojima crafted seems to be integral to the overall plot of his games. Gamers did feel that The Phantom Pain ended rather abruptly, even if we didn’t even know that there was an entire episode that was removed. They would need much more time to tell the kind of story that were used to from a Metal Gear Solid game. I’m not saying that it would be impossible to do. I’m sure there is a way or two to still manage to salvage a decent film from the property. I’m just saying that I would be more confident if they made a television series instead of a movie. Here’s hoping that the upcoming Castlevania Netflix will prove me right and becomes the model that Metal Gear Solid follows instead.